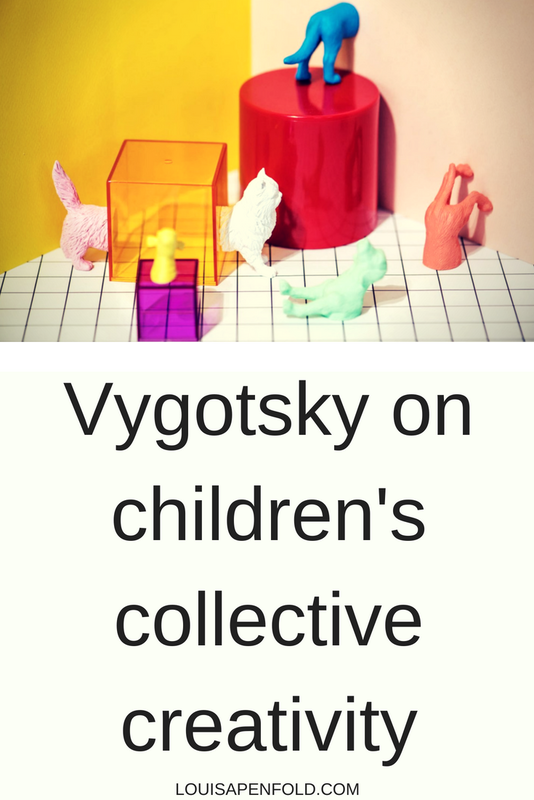 This post shares Vygotsky’s idea of collective creativity, a concept presented in his article ‘Imagination and Creativity in Childhood’. I firstly talk about how he defines creativity and imagination. I then use these understandings to consider how children’s creativity emerges through play. Toby K’s ‘Echo table’ on display at the Ipswich Art Gallery in Australia. 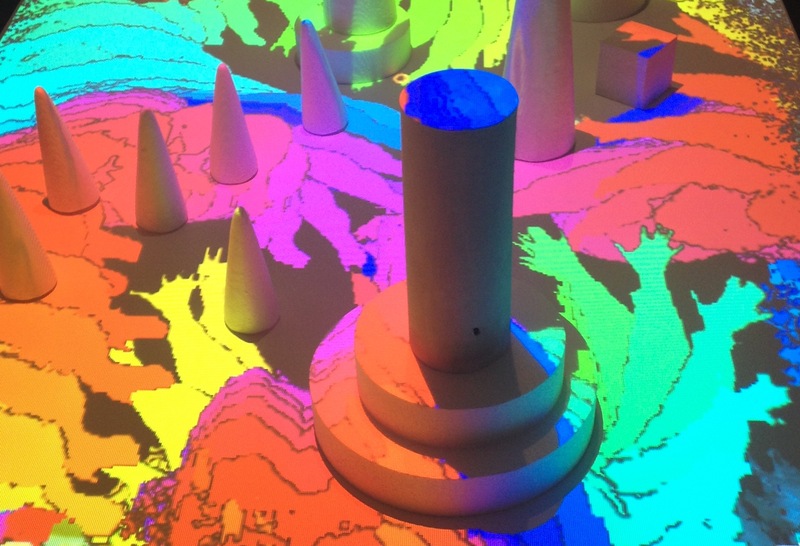 This interactive artwork encouraged children to draw using their shadow. Lev Vygotsky (1896 -1934) was a Soviet psychologist who researched children’s learning in social and cultural contexts. In particular, his theory of ‘social constructivism’ discussed the importance of social interactions in children’s cognitive development. Vygotsky was also very interested in creativity and imagination how these were understood in education. Vygotsky believed that creativity arises from any human activity that produces something new. Creative acts could produce anything from physical objects to a music score to a new mental construct. Creativity is therefore present when major artistic, scientific and technical discoveries are made. It is also existent whenever an individual alters, combines, images or makes something new. Like Simon Nicholson’s ‘theory of loose parts‘, Vygotsky believed that creativity is something that exists in all people, including very young children. Imagination was also considered to be an integral part of creativity through its ability to support the production of new combinations of pre-constructed things. How is creativity a collective process? “When we consider the phenomenon of collective creativity, which combines all these drops of individual creativity that frequently are insignificant in themselves, we readily understand what an enormous percentage of what has been created by humanity is a product of the anonymous collective creative work of unknown inventors” (Vygotsky, 1930:5). For example, take Gordon Bennett’s ‘Triptych: Requiem, Of grandeur, Empire’ (1989). The artist draws on a rich history of ideas and techniques already in existence. These include the Renaissance tradition of triptych oil painting, the imagery of Tasmania’s last Aborigine, the vast Australian landscape and Catholic symbolism. Bennett recombines these with his personal experience of growing up as an Indigenous Australian with British ancestry. Whilst the painting may appear to have been made in creative isolation, it is building on previous artistic, scientific and technical discoveries. Triptych has been produced as part of a cumulative and creative process that has emerged over multiple events and time frames. How is children’s play related to creativity? Vygotsky believed that the origins of creative imagination are situated in children’s play. Play is understood as a creative act that reconstructs, appropriates and transforms human experience to produce new realities. Imaginative play is presented as an integral part of experiencing the world from new and multiple perspectives. Like John Dewey, Vygotsky believed that the creative process is deeply interconnected to both lived and imagined experience. The richer an experience, the more likely the event is to fuel creative acts “…the more a child sees, hears, and experiences, the more he knows and assimilates, the more elements of reality he will have in his experience, and the more productive will be the operation of his imagination” (Vygotsky, 1930:15). Allowing children access to rich and diverse sensory experiences is critical in supporting divergent learning. This understanding of creativity is useful in how it links imagination, lived experience and play to children’s learning. Human activity is emphasised as the core driver in the creative process. This is great in acknowledging the active role children play in facilitating their own learning. However, an emphasis on human activity is also limited in that it does not look at the role of non-human things, like materials and nature, and how these also influence the creativite process. Vygotsky also made a clear distinction between nature and culture through stating that the latter is the product of human-mediated creative activity. This creates a separation between human and non-human things. If we are to think of the world as a complex system of both people and matter, paying attention to the transformative interactions between nature, culture, materials, society and people is really important. Doing so may open up new modes of creative production. Vygotsky, L (1930/1968). ‘Imagination and Creativity in Childhood.’ Journal of Russian and East European Psychology. 42 (1). Note: This post is an updated version of ‘Vygotsky, collectively creativity and the power of imagination,’ published on Art Play Children Learning in July 2015.